On the Description tab, you provide long and short descriptions for your app's listing in the Appstore. This field appears only if you are submitting a new version of an existing app. Describe the changes you've made in this update. On your app's Appstore details page, release notes appear in a "Latest updates" section. On Fire TV devices, users (who have installed the app) see the release notes in the Notifications section in Settings. On Fire tablets, users see the updates in the notifications pull-down menu at the top. The app title that will be displayed in your app's listing on both the Appstore website and on devices. The display title should be brief and does not have to be the same as the App Title field on the General Information tab. 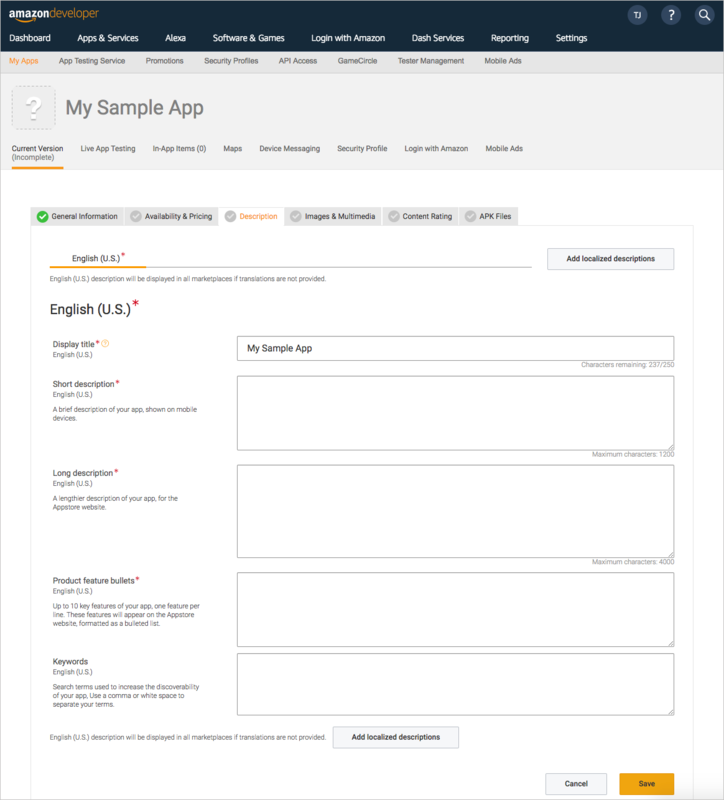 If you would like to refer to Amazon or any Amazon product or service (including Kindle or Fire) in the title of your app, refer to the Amazon Trademark, Brand, and Marketing Guidelines. A short description of your app that is appropriate for display on a TV or tablet device. The maximum length is 1,200 characters, but consider using a shorter description. (Paragraph breaks get stripped out.) The Fire TV UI displays displays only the first 200 characters, then shows an ellipses to read more. Optimize your short description to include the most important information up front. If your app allows in-app purchasing, a note gets automatically appended to the end of your description. Three to five key features of your app, one feature per line. Press Return after each feature. The Dev Portal will automatically convert each item to a bullet item each time that you press Return. Go to the next step: Step 3: Add Images & Multimedia.